The S/PDIF Transceiver module is based around the Wolfson 8804 S/PDIF receiver chip. 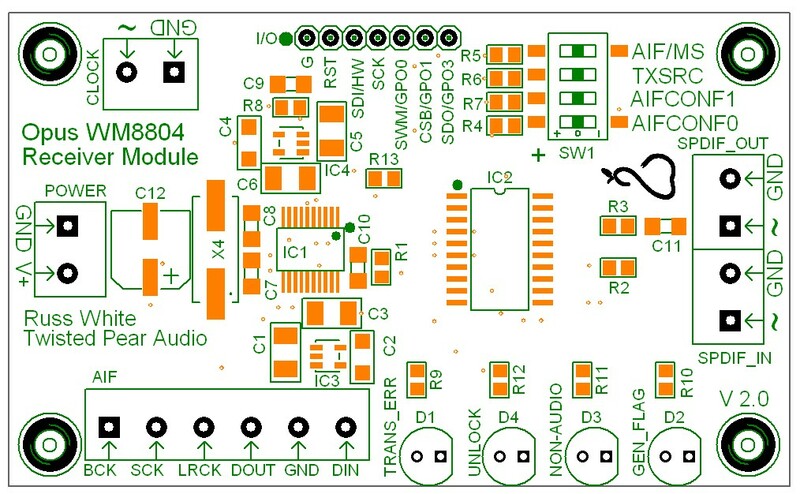 This module provides a single-ended S/PDIF input (off-board connector) and an I2S output to feed the DAC module. 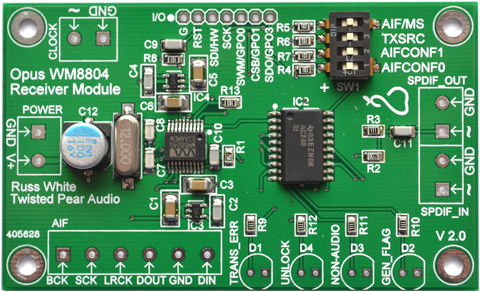 It can also be used to convert an I2S input to an S/PDIF output. For those who want TOSLINK optical input, an off-board TORX connector will be available which can feed the S/PDIF input of the receiver board. Digital power sections (3) feature National Semiconductor low-drop out (LDO) regulators. Power supply electrolytic capacitors are United Chemi-Con NPCAP-PXE and resistors are Susumu 0.1% thin film. All connections are made with Phoenix terminal blocks.